Can “off-the-shelf” cells improve CAR-T therapies in the future? The last few years have been a whirlwind time for immunotherapy. Novel gene and cell therapies have emerged on the scene as a new way of treating cancer using human cells rather than traditional medicines. 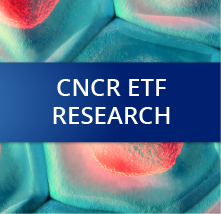 The Cancer Immunotherapy ETF (Nasdaq: CNCR) has been investing in companies at the forefront of this approach since the fund started trading on Nasdaq in 2015. Today, we look back at the history of Chimeric Antigen Receptor T-cell (CAR-T) therapy, one of the most prominent types of cell therapy, and examine how companies are trying to improve on it using new cell engineering technologies. This article is part of a series of research that we plan to publish as a service to investors to highlight key advances in immunotherapy and explore potential future directions for the field. 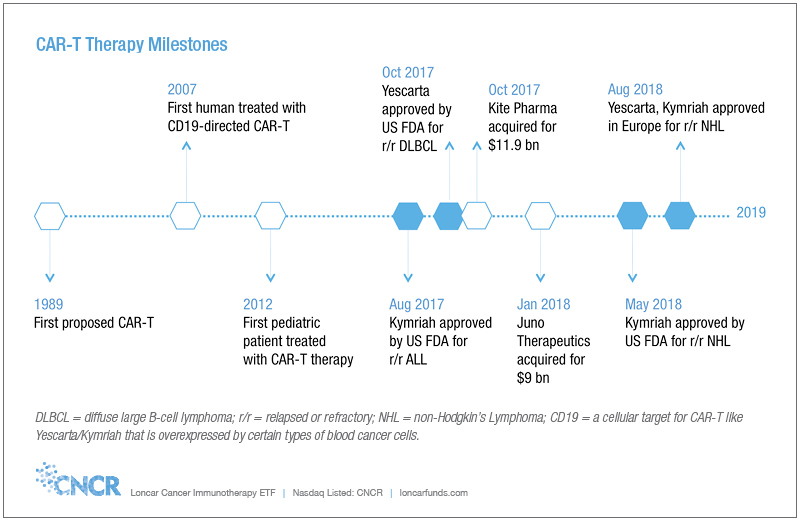 CAR-T therapy recently completed its one-year commercial anniversary, following the landmark approval by the United States Food and Drug Administration (FDA) of Novartis’ Kymriah in August 2017 for the treatment of a type of childhood leukemia. This was the first time one of these treatments was approved anywhere in the world. Since then, investors have seen a flurry of regulatory activity, with the FDA and their counterparts in Europe approving both Kymriah and Gilead’s Yescarta for a type of aggressive lymphoma in adults. Mergers and acquisitions in the CAR-T space have also been a boon to the field, as shareholders saw the $12 billion acquisition of Kite Pharma by Gilead last fall swiftly followed by Celgene’s $9 billion deal for Juno Therapeutics in January of 2018. Unlike traditional approaches to cancer treatment, such as using chemotherapy or antibodies, CAR-T has broken ground as the first approved therapy to use engineered human cells to fight cancer. To understand better where the field came from and where it might be headed, it is important to understand what types of cells have traditionally been used for this process. The original CAR-T therapies, like Kymriah and Yescarta, use something called autologous CAR-T therapy, where the immune cells (T-cells) used for the treatment come from the patients themselves. After being drawn and separated from other cells in the blood, these T-cell are genetically engineered with a feature called the chimeric antigen receptor (CAR), and reinfused in patients. The chimeric antigen receptor helps the modified T-cells locate and target cancerous cells in the patient. Using this autologous CAR-T approach has shown remarkable results against certain types of cancer. For example, data published in the New England Journal of Medicine on December 28, 2017 from Gilead’s trial of Yescarta showed that as many as 80% of adults with aggressive lymphoma who failed chemotherapy entered at least partial remission after receiving the CAR-T. Further, over half of patients treated saw a complete reduction in their tumors. That is a very meaningful outcome, especially for advanced patients like the ones in the trial who stopped responding to traditional treatments and had limited treatment options available. However, as promising as this cell therapy breakthrough has been, like anything new it is not without limitations. We would like to see CAR-T work for more patients and in more types of cancer. Also, while clinically meaningful, the first wave of approved CAR-T therapies has struggled with some commercial and scientific realities of this highly personalized approach to medicine. For example, one drawback to autologous therapy is that these patients with advanced, aggressive cancer must wait at least 2-3 weeks for their therapy to be manufactured. For those that do receive treatment, the complexity of the process carries with it a hefty price tag, with Yescarta and Kymriah carrying a list price of $373,000 in the United States for lymphoma. So, what can be done to address the shortcomings of autologous CAR-T therapy? Instead of using a patient’s own cells, companies working on next-generation technologies seek to overcome the limitations of autologous cell therapy by using allogeneic, or “off-the-shelf,” cells derived from a healthy donor. 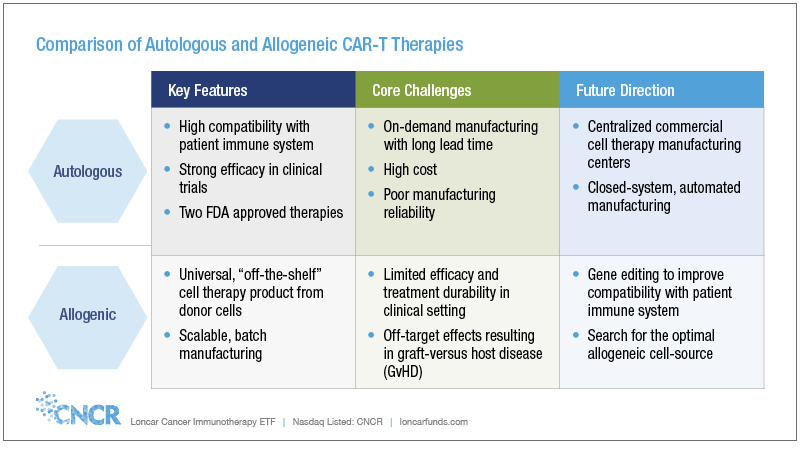 In this article, we compare autologous and allogeneic approaches side-by-side and try to examine the potential for “off-the-shelf” approaches to CAR-T therapy. We also review the technologies being developed by industry-leading cell therapy companies held by the Cancer Immunotherapy ETF. Autologous CAR-T therapy started as an idea: reengineering a patient’s immune cells to fight cancer more effectively. As the development of the underlying chimeric antigen receptor (CAR) technology made it possible, autologous treatment was an attractive model as the first use for several reasons. First and foremost, the therapy is expected to be compatible with a patient’s immune system because the CAR-T cells are derived from a patient’s own cells. That is clinically important from a safety and durability standpoint. From a scientific perspective, autologous therapy also provides an important proof-of-concept. By introducing a single modification—the chimeric antigen receptor—existing immune cells are galvanized against cancer cells with remarkable efficacy. 1. Apheresis. A patient’s white blood cells (leukocytes) are removed in a procedure called apheresis and then shipped from the medical clinic to a centralized manufacturing facility. Gilead, for example, currently does all its manufacturing work in Los Angeles. Therefore, any patients receiving Yescarta will have their cells sent there. 2. T-cell activation. Once at the manufacturing facility, the cells are enriched for T-cells, a specific type of immune cell, and the T-cells are then “activated” by exposing them to a cocktail of signaling molecules which cause them to grow and replicate. 3. T-cell engineering. A method of gene transfer, such as a modified viral vector, is used to insert a new gene that contains the information for the CAR into the T-cells. The modified cells begin to display the chimeric antigen receptor, which allows T-cells to recognize cancer cells that have the receptor’s complement (referred to as an antigen). 5. Reinfusion. Modified cells are shipped back to the clinic and infused in the patient. Prior to the infusion, patients receive chemotherapy to deplete normal immune cells, which allows CAR-T cells to expand more efficiently inside the body. The entire manufacturing process for an autologous therapy generally takes at least 2-3 weeks. The complicated nature of autologous cell manufacturing leads to its three main shortcomings: time, cost, and reliability. A lengthy manufacturing process may allow patients to deteriorate while waiting for treatment. It takes time to grow cells, and engineered CAR-T cells need to replicate many times before there are enough cells for an effective treatment. In patients with advanced, aggressive, and relapsed cancer, several-weeks delay can be critical because they might see their cancer progress in the meantime. Several options such as bridging therapy—a method of treating patients waiting to receive a CAR-T infusion—are being explored to try and prevent patients with advanced cancer from developing progressive disease before receiving their manufactured cell therapy. Complex manufacturability begets high cost of goods sold. Because of the intensive nature of the manufacturing process and the stringent quality controls associated with manufacturing therapies using live cells, autologous therapy carries with it a hefty price tag to manufacturers. Further, because the therapy must be made on-demand following apheresis, the manufacturing process is difficult to scale effectively. The cost of goods for autologous therapy has been estimated to be around $25,000-$35,000 per manufactured dose and may be much higher in reality. Lack of manufacturing certainty means some patients do not receive treatment. Several clinical trials have faced challenges manufacturing a viable therapy for patients. Novartis, for example, has seen manufacturing failure rates as high as 9% with Kymriah. This is unfortunate because to undergo autologous CAR-T therapy, patients might delay other treatment options to wait for a therapy they never receive if the manufacturing process fails. Manufacturing failure can occur for several reasons, but the most common challenge is expanding modified T-cells to achieve a therapeutic dose of 1-2 million cells. If the blood drawn from the patient has a low number of T-cells to start with, or if the T-cells fail to activate effectively during the manufacturing process, it can be difficult to produce a dose within quality control standards. Can allogeneic cell therapy be the answer to these challenges? There has been a boom of work in this area recently. Allogeneic treatments seek to overcome challenges by using engineered cells from healthy donors. Unlike autologous therapy, allogeneic manufacturing is not limited by on-demand manufacturing. In other words, the treatment can be made in advance—hence the name “off-the-shelf.” This key difference results in several benefits in terms of manufacturability. First, therapies are universally manufactured and can be made available as soon as the patient is referred for treatment. Not only would this be more convenient, but it might also allow for quick re-dosing for patients who are no longer responding to initial treatment. Second, because the treatment is available off-the-shelf, there is minimal risk that a patient fails to receive treatment due to a manufacturing failure. Finally, allogeneic therapies can be manufactured in batches, which allows manufacturing to scale more effectively. A study published last month by Suzanne Farid and Michael Jenkins in the Biochemical Engineering Journal suggests that allogeneic CAR-T could made at-scale for $7,500-$10,000 per dose. Given all of this, it is easy to see how allogeneic therapies could disrupt the field. However, allogeneic therapies come with their own set of hurdles compared to today’s autologous approaches, and they also introduce new risks that are inherent to receiving treatment with someone else’s cells. These are the problems that companies are working to solve now. Allogeneic treatments have been slow out the gate in terms of efficacy. In a study that was led by the National Cancer Institute in 2016, only 8/20 patients were reported to experience an observable response to treatment with allogeneic CAR-T. The response rate for one specific cancer type, acute lymphoblastic leukemia (ALL), looked good with 4/5 seeing complete responses, but results for others were less compelling. Another early study published in 2013 by a group out of Baylor University saw modest responses in 2/6 patients treated with donor-derived T-cells. Many of the allogeneic studies thus far have also disappointed clinically in terms of treatment durability, with a high number of patients entering relapse after achieving an initial response to treatment. One of the strengths seen by autologous treatments is that patients achieving remission tend to remain in remission for a long time. For example, in the most recent data from ZUMA-1, the pivotal trial for Yescarta, which was presented at the 2018 American Society of Clinical Oncology (ASCO) annual meeting, the majority of patients treated with autologous CAR-T remained in ongoing remission at close to a year after starting treatment. This remains a benchmark of treatment durability for allogeneic therapies to target. 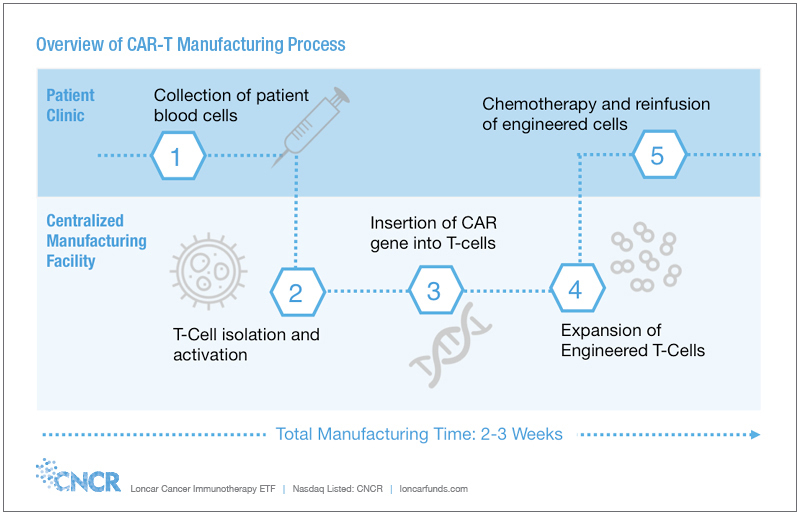 • CAR-T expansion. After they are infused in a patient, CAR-T cells must expand in the body to achieve a widespread anti-cancer effect. The rate at which the T-cells expand is subject to the Goldilocks effect—too little expansion and efficacy is marginal, but too rapid expansion and the treatment-related toxicities can be insurmountable. Intrinsic properties of human cells, such as where the cell comes from and how it interacts with the patient’s own immune system, can affect how the cells expand in a patient. • Persistence. In addition to expanding effectively, CAR-T cells must persist in circulation to continue having an anti-cancer effect. CAR-T cell persistence is an important parameter in determining the durability of a patient’s response to treatment. Many factors, such as activity of a patient’s natural immune system against an allogeneic CAR-T derived from a donor’s cells, can affect the persistence of CAR-T cells. • T-cell exhaustion. Allogeneic T-cells can become exhausted, where they start to express signaling proteins like immune checkpoint inhibitors that can dampen the immune response to a cancer. CAR-T leaders are exploring several strategies to combat T-cell exhaustion. One strategy uses genetic engineering to incorporate CAR-T designs with new stimulatory technologies. Several companies are also exploring combination therapies with immune checkpoint inhibitors, such as Merck’s Keytruda, to extend the life span of CAR-T cells. Yet another strategy uses a certain type of donor cell, called virus-specific T-cells, to improve cell signaling. On the safety side, one unique risk allogeneic therapies theoretically bring is called Graft-versus-Host Disease (GvHD). Human immune cells are programmed to recognize and attack foreign bodies. They do this by recognizing foreign targets called antigens via a T-cell receptor (TCR). The TCR is a protein expressed by T-cells that acts like a tracking device looking for these foreign antigens. With allogeneic CAR-T therapy, transplanted donor t-cells can recognize a patient’s healthy cells as foreign and attack. This happens because the TCR from a donor cell identifies healthy tissue antigens in the host as foreign. The activity of the graft (in this case an allogeneic CAR-T) against the host can theoretically cause symptoms ranging in severity from a mild rash to patient death. Some companies developing allogeneic CAR-T therapies are deploying genetic engineering strategies to prevent graft-versus host disease. Gene editing tools such as TALEN or CRISPR are used to remove the TCR gene from allogeneic CAR-T cells, thus preventing the CAR-T cells from binding to healthy tissues via the TCR. The Loncar Cancer Immunotherapy ETF (CNCR) seeks to incorporate holdings with immunotherapy technologies that are positioned to have the largest impact for patients. 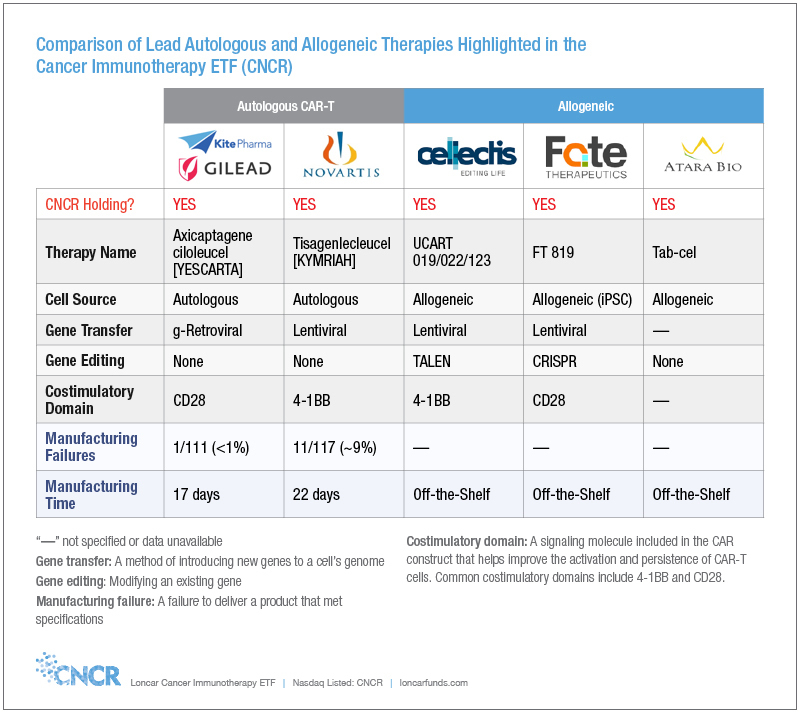 As such, CNCR holdings include a variety of the top companies developing autologous and allogeneic therapies. View all holdings of the Cancer Immunotherapy ETF. Cellectis SA (Nasdaq: CLLS): Cellectis is a French biopharmaceutical company that solely focuses on developing allogeneic cell therapies. It currently has several next-generation CAR-T assets under clinical and preclinical development. You might recall how Loncar Funds conducted a video interview last year with the company’s Chairman and CEO, André Choulika. Hear in his own words why the CEO of Cellectis believes that an allogeneic approach is the future of cell therapy. The company’s lead compound, UCART019, is out-licensed to Allogene, the allogeneic CAR-T startup captained by ex-Kite CEO Arie Belldegrun, via a partnership agreement with Pfizer and Servier. At a medical conference in Europe this summer, the partners posted encouraging results showing that 5 out of 6 pediatric leukemia patients experienced a complete remission after receiving the treatment and 8 out of 10 adult lymphoma patients as well. However, these studies later showed a higher rate of disease relapse and/or death than what we have seen with autologous therapies. This might illustrate how allogeneic therapies require further optimization to improve treatment durability, but it is worth mentioning that the high relapse rates could be due to either the cell dosage in the trial or the very late-stage nature of the patients treated. We anticipate a new update about how the trials are going at the American Society of Hematology (ASH) annual meeting in December and will be watching the results closely. Cellectis also shared an interesting piece of news in September when it announced that Dr. Stephan Grupp of Children’s Hospital of Philadelphia (CHOP), one of the original CAR-T treating physicians, would be joining their clinical advisory board. Dr. Grupp started the first pediatric CAR-T trial in leukemia in 2012 and is highly experienced in the development of these types of therapies and the treatment of children with CAR-T. It is an encouraging sign that such an expert in the field sees the value in allogeneic approaches to cell therapy. Fate Therapeutics (Nasdaq: FATE): Fate currently has a cell therapy program and trials ongoing using a type of cell called a natural killer cell (NK). Therefore, this is a little different than using T-cells for CAR-T. In Fate’s case, the NK cells are sourced from a healthy donor and activated outside the body with small molecule modulators before they are used as treatment against cancers such as ovarian, fallopian tube, or primary peritoneal cancer. We expect to see a data update from this program at a conference called the Society for Immunotherapy of Cancer (SITC) in early November (during which Fate will host its own analyst and investor event) and the company will also have various presentations of its technologies again at ASH in December. While the above NK program is interesting, many people are watching closely for a next-generation allogeneic technique Fate hopes to use for cell therapies in the near future. They aim to build the cells from scratch using induced pluripotent stem (iPS) cells. Stem cells are a normal precursor to healthy human cells that replicate and differentiate to maintain all the cells in your body. An iPS cell is like a reverse engineered stem cell—instead of a stem cell differentiating into a mature cell, a mature cell is reengineered to create a pluripotent stem cell. You then have a clean slate with which you can build any type of cells you want—with any features you want. With the right engineering, Fate’s iPS cells can differentiate into over 200 different mature cell types, which provides a myriad of engineering possibilities. This has not yet been done before as a cell therapy for cancer. Fate currently has an application pending with the FDA to develop a second-generation NK program using iPS as the base, and hopes to do the same for CAR-T later in 2019. In 2016, Fate launched a partnership with Memorial Sloan Kettering (MSK) in New York, led by CAR-T pioneer Michel Sadelain, to develop allogeneic T-cell therapies using their platform. Then this past May, the company announced a revision to the agreement to expand access to the institution’s intellectual property portfolio. Memorial Sloan Kettering and Dr. Sadelain have been at the forefront of developing cell therapies for more than a decade and it is encouraging to see Fate land such an experienced partner and build on the collaboration over such a short period of time. This is another example of a pioneer in the field lending significant resources and credibility towards developing allogeneic approaches. In addition to this EBV program, Atara maintains academic collaborations with Memorial Sloan Kettering and Moffit Cancer Center and is exploring more traditional allogeneic programs like CAR-T in the future. In short, they want to be a leader in off-the-shelf cell therapies. Earlier we highlighted how experts in the field have partnered with other allogeneic companies. Atara had an interesting announcement of their own in September when the company announced that Roy Baynes, Merck’s Chief Medical Officer, joined their board of directors. Merck is an immunotherapy leader with its checkpoint inhibitor drug Keytruda, so this is a meaningful addition to the board. In the press release announcing the news, Dr. Baynes said “Atara is a leader in off-the-shelf, allogeneic T-cell immunotherapy, a technology that is increasingly being recognized as the next generation of medical innovation.” This is yet another case of a leader in the field lending his or her support to allogeneic therapy approaches. Cell therapies like CAR-T have been a tremendous breakthrough for patients living with certain cancers. Perhaps more importantly, the technology has opened a gateway for countless new engineering strategies to catalyze the activity of the human immune system against cancer. However, the highly-personalized nature of today’s autologous cell therapies come with various medical and commercial limitations. Ongoing efforts to develop next-generation, allogeneic treatments seek to overcome the limitations of autologous therapy to expand access to a potentially life-saving treatment. These allogeneic therapies currently face efficacy and safety hurdles that must be overcome, but they have the chance to revolutionize the use of cell therapies in the future if they do. There are many companies that have partnered with leaders in the field on this, and we wish them success as they aim to deliver important new therapies to patients. Opinions expressed are those of the author or Funds and are subject to change, are not intended to be a forecast of future events, a guarantee of future results, nor investment advice. Fund holdings and allocations are subject to change at any time and should not be considered a recommendation to buy or sell any security. Celgene, Allogene, Pfizer, and Servier are not a holding of the Fund or affiliated with the Fund.